Secluded three bedroom villa with 50 sq.m swimming pool, pool house and a double garage with stunning views of the countryside and the hills. This one level property is located in very pretty countryside, only 5 minutes driving distance from the village of Santo Estêvão. The coastal town of Tavira and the nearest beaches are approximately 15 minutes drive. 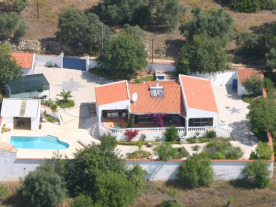 The city of Faro and the International Airport are both approximately 40 minutes away. All year round golf courses and bowls clubs are only 15 - 20 minutes away and Spain can be reached within 40 minutes, for superb shopping in Ayamonte. Casa ABC (ABC stands for Almond Blossom Cottage - the land around has hundreds of Almond Trees giving breathtaking blossom in January) is on its own plot of land of 880 sq. m. completely surrounded by a high wall, giving privacy and seclusion. The garden has been laid to calçada (portuguese cobbles) with plant beds supporting mature trees including Carob, Jacaranda, Olive, Orange, Sharon Fruit/Loquat and other fruit varieties. We love our sub-tropical plants and shrubs including cacti, and bougainvillea, and our temperate climate plants - wisteria, honeysuckle, roses and many others. The swimming pool, with its quaint little corner roofed shade, and a large pool house, is surrounded by a large terrace constructed from locally made Santa Catarina tiles. The pathways surrounding the house are made using traditional cobblestones and also Santa Catarina tiles. If you like walking you can take advantage of this activity in all directions in beautiful countryside from the main gate. Bird-watchers will love the buzzards, little owls, egrets, hoopoos, swallows, jays, azure winged magpies, and our golden oriole (papa figo, he loves figs!) who sings his hauntingly liquid gold song in the trees around. Here we feel close to the natural order of things, earth moon and stars. Inserted into the calçada we have an 8 point compass to reflect Tom's nautical background and also a 5 point pentacle to honour the elements - Fire, Earth, Sky, Water, Air. The night sky here is "heavenly" as there is no light pollution - amateur astronomers will be very attracted. Making music with drums, flutes and singing was one of our favourite pastimes - and here there are no neighbours within annoying range. Writers of poetry and books will find peace and solitude and painters will be inspired to creativity by the ever-changing vistas. We have had wonderful parties here entertaining friends of many nationalities, all of whom have said how much they loved it. What a beautiful spot! Furniture is included in the reduced price €395,000, which is the same price as we paid 12 years ago. We upgraded and improved the property - insulation of the ceilings on the inside of the house, new drains, new windows and doors and electric shutters and shades, as well as a ramp to enable disabled access and a complete reconstruction of the garden and pool area.